Figure 1 and 2 show a 6 cm long blade from Badegoule with abrupt, scraper like retouches on the proximal and distal ends and typical small "perçoirs", integrated into the artifact. Such "spiky" appearance is not rare during the Badegoulian-see here 1679 and here: 1682 . Microtraceological studies are missing about such highly visible and characteristic traits, first described in detail by Cheynier during almost 90 years ago (Figure 3). Transverse burins together with singel, double or star shaped perçoirs dominate the Early Badegoulian (Badegoulien Inferieur), whereas the raclettes dominate the Late Badegoulian (Badegoulien Superieur). The region of origin of the Badegoulian seems to be the Aquitaine with dates from 23 to 20,5 k.a. BP. 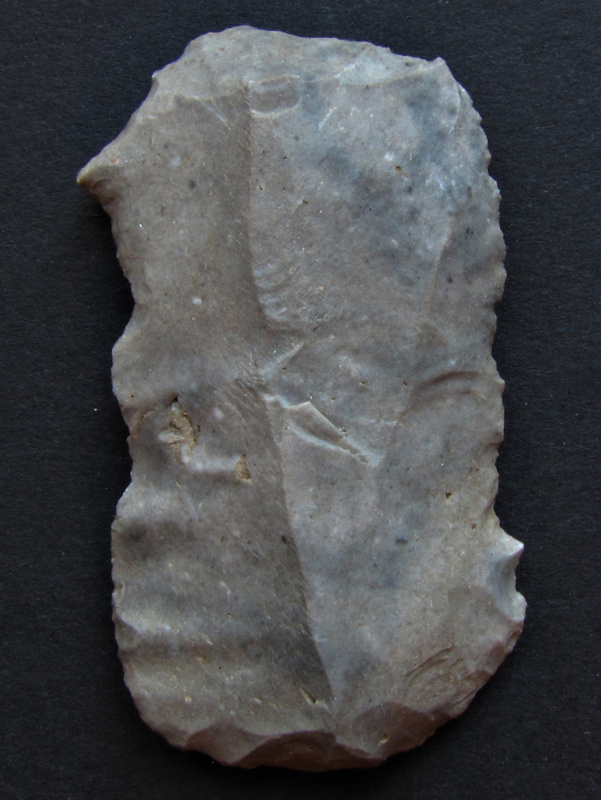 Important new sites were excavated during the last 20 years like Pégourié, Cuzoul-de-Vers, and Casserole, while the earlier diggings at Laugerie- Haute Est have lost their importance. 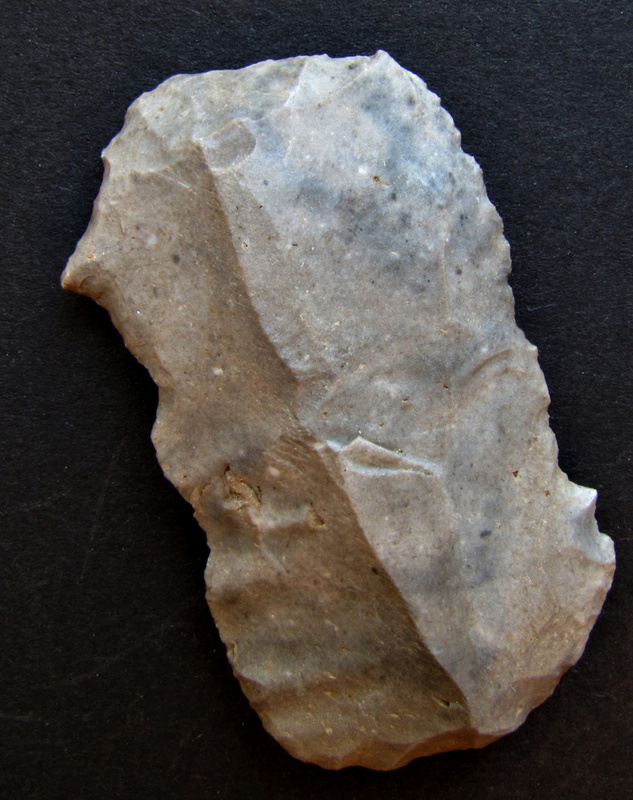 In the Cantabrian region a slightly different toolkit assigned to an Archaic Magdalenian/Badegoulian has been dated to 22,2-19,5 k.a.cal BP, and in the Mediterranean Iberian Peninsula to 22,6 and 21,1 k.a.cal BP. In France, there are in total 48 Badegoulian sites, for example in the Charente (Placard), Indre (Abri Fritsch), Haute Loire (Saint-Nizier-sous-Charlieu, Le Blot) and in the Seine-et -Marne Departments (Bois des Beauregards), to name just a few. Compared to the preceeding Solutrean, the techno-typological system of the Badegoulian remains an essential break, which can not be easily explained. The Badegoulian always precedes the Early Magdalenian when the two entities are present and is characterized by a high grade of variability and flexible adaption. Blade production is always represented, mainly for Burins (diedre, on truncation: see Figure 4 from Badegoule). It is associated with autonomous flake production aimed at specific intentions among which the making of blanks for “raclettes” is the best example. In agreement with the most recent studies, a genuine and specific bladelet production was invented during the Badegoulian. Backed bladelets were removed from Badegoulian specific cores called “pièces de la Bertonne”, and “pieces of the Oisy technique” . Tranversal Badegoulian burins have been identified as cores for the production of different non–backed bladelets. The early Magdalenian (20,5- 18 k.a cal. BP), in contrast shows a progressive disjunction of “domestic” and “hunting” economic intentions. Techno-typological concepts are more elaborated and sophisticated. 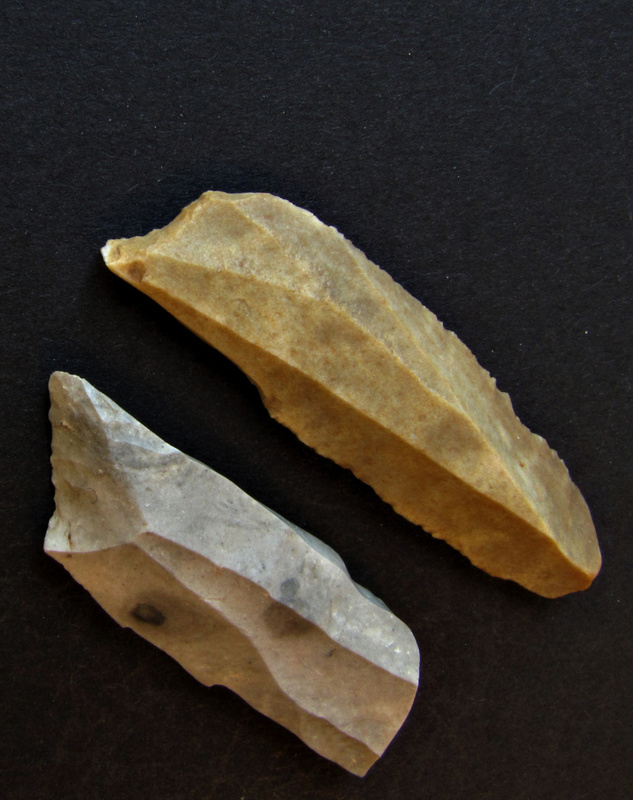 „(During the early Magdalenian) the number of good blades increased, and generated a higher demand for good quality flint. 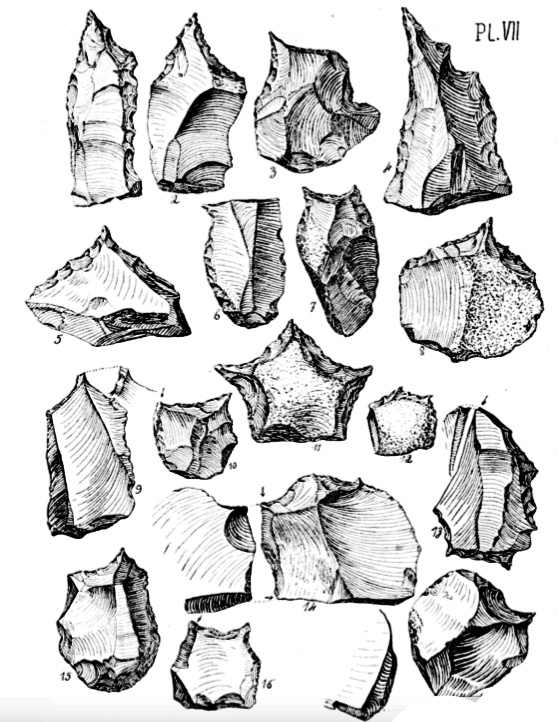 Bladelet production shows a techno-economic development: while in the Badegoulian one dominant method allowed knappers to obtain a large range of blanks (bladelets and micro- bladelets, lamellar flakes) used for the manufacture of both domestic tools and hunting equipment, in the Lower Magdalenian, a larger variety of production methods was used solely to obtain (micro-)bladelets used as elements of hunting weapons. Thus, in parallel to the disappearance of “raclettes”, the Recent Badegoulian-to-Lower Magdalenian transition is characterized by a progressive reconfiguration of the lithic technical system: the techno-economic “overlapping” of the domestic and the hunting aspects in the Badegoulian gradually gave way to a more “disconnected” organization of these “spheres” during the Lower Magdalenian. This “disconnection” phenomenon went along with a revealing technical “compartmentalization” of flint- and antlerworking. Indeed, in a clear techno-economic continuum, a technological break of the antlerworking characterizes the beginning of the Magdalenian through the reappearance of the GST technique in the Lower Magdalenian" (Ducasse 2012).